The Chinese Horse likes to roam. They love traveling and have a lot of energy. They are appealing and friendly. Socializing is a great way for them to spend their time. They may be rather hot tempered or headstrong, but they are also the life of the party. Freedom is important to them. They love to be the center of attention. They are very intelligent and learn easily. Horses are honest and open minded, even if they do focus on themselves frequently. 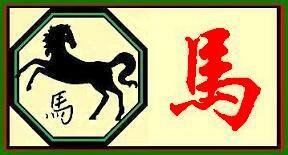 The Chinese Horse tends to follow their whims and forget about the big picture. This can lead to broken relationships, quitting jobs and unfinished projects. They tend to feel a bit inferior, even when it is not true. This feeds into their need to move on to a new group. They are rather impatient, which may cause them to not think of how others feel. Self-reliant horses don't like routine, but will do whatever is required to reach their goals. Those born in the year of the Chinese Horse excel in jobs where they get to be with others. They don't particularly care for taking orders. They are good at communicating and like being in charge. They may excel in a job like bartender, librarian, pilot, journalist, or sales. Horses are usually very healthy. They love to exercise and keep fit, both mentally and physically. If they feel trapped, it can lead to illness. While they want to be loved and have an intimate partner, this often makes them feel trapped in the end. They have a magnetic attraction, and they meet others easily. Horses are natural romantics and know how to make their partner feel wonderful. They may be very vulnerable when in love. They tend to fall hard and fast. They give so much of themselves, and then they get worn out and find someone new. As Horses get older, they tend to develop stronger, more stable relationships. Horses are most compatible with Dogs and Tigers. They are least compatible with Monkeys and Rats. Metal Horses (1930, 1990, 2050) are free spirited. They are afraid of commitment and prefer leaping from one partner or job to the next. They do make great friends, though. Water Horses (1942, 2002, 2062) are indecisive, but they adapt quickly. They go with the flow. They are fun to be around, even if they do confuse everyone around them because they can't make up their minds. Wood Horses (1904, 1954, 2014) are strong and stable. They play well with others and usually develop successful relationships, both in their professional and their personal lives. Fire Horses (1906, 1966, 2026) like to live life on the edge. They love change and often embrace it just for the sake of making a change. They are opinionated. Earth Horses (1918, 1978, 2038) work hard to meet their goals. They can see things from many perspectives, which helps them make good decisions. They have a great sense of humor and can adapt to many situations.